Energy Healing - ​Welcome to​Inner-Soul Coaching! Holistic Healing therapies that move energy are referred to as Energy Medicine. The goal of Energy Medicine is to correct imbalances and create a stable flow of energy in the client’s “life force”, referred to in Chinese medicine as “chi”, Japanese modalities as “ki”, and Indian Ayurvedic Medicine as “prana”. 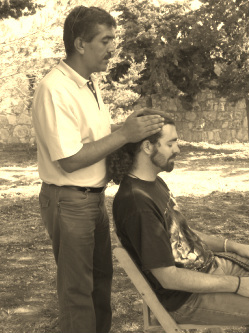 Energy Healing uses different techniques such as laying hands above the body as in Therapeutic Touch or on the body as in Reiki. The Human Energy Field, Aura, or Pranic Body is worked with in applying these healing modalities. Reiki (pronounced Ray Key) is a combination of two Japanese words rei and ki meaning “universal life energy”. Reiki is an ancient laying-on of hands healing technique that uses the life force energy to heal, balancing the subtle energies within the body. Reiki addresses physical, emotional, mental and spiritual imbalances by opening energy channels in the body and sending energy to where it is needed. Reiki can be performed on all living things. People, pets, and wildlife can benefit from Reiki. It is an energy that can be sent for distance healing to all sentient beings as well as situations requiring healing. The "giver" of Reiki is a facilitator who channels universal life force into the "receiver". Everyone has life force in and around them and it ebbs and flows with daily life interactions, reactions, trials and tribulations. Energy imbalances can manifest as emotional or physical illness so balancing and replenishing the life force is vital to health and healing. This is done during a Reiki session. 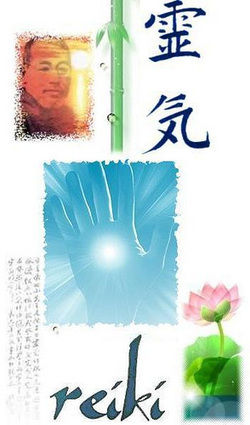 Reiki is practiced all over the world. It is offered in hospitals, private practices, and as a complement to other healing modalities. Research indicates that Reiki facilitates faster healing time after surgery and illness. Reiki elicits the relaxation response in the body/mind which engages the parasympathetic nervous system. This response enhances the immune system, promoting healing. Stress related symptoms such as headaches, stomachaches, digestive problems, and anxiety, are due to imbalances in our energy system. Reiki helps reduce and heal these symptoms as well. Level One practitioners learn the laying on of hands in various positions, correlated to the seven chakras in the body’s energy field. Level Two practitioners add the use of symbols and distance healing. Master Level practitioners are experienced and can pass on training through attunements, initiating the learner into the various levels of practice. Some other energy healing modalities that use the laying on of hands or placement of the hands in the energy field just above the physical body, are Therapeutic Touch, Pranic Healing, Acupressure, Massage, Aura Healing, Prana Vidya, Energy Medicine, and Guided Intention. In an Inner-Soul Coaching session, clients are fully clothed and can be seated or laying down during an energy work session. Sessions include intake information, energy work, and closing information. Each session varies and can last from 30 to 60 minutes depending on each client's goals and intentions. The Inner-Soul Coaching process approaches energy work from an eclectic perspective, blending energy healing techniques from multiple modalities. These methods include Reiki, Pranic Energy work, Tuning Forks, Guided Intention, and tapping which facilitate healing and deep relaxation. The client learns to work with their own energy as part of the healing process as well.